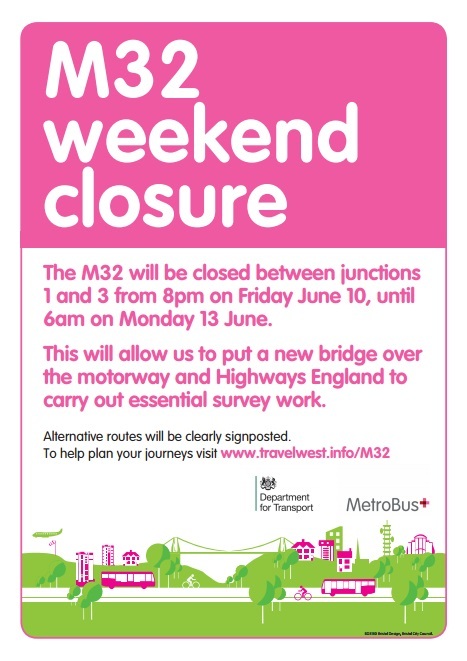 This is a reminder that there will be some closures on the M32 motorway near Bristol this weekend. The closures start from 8pm on Friday 10 June and continue until 6am on Monday 13 June. The closures are between junctions 1 and 3. They are taking place so a new bridge can be put in place over the motorway for the MetroBus. Extra Park and Ride services will be operating from Bristol’s Park and Ride sites at the weekend. Please see the Travelwest website for more information about additional Park and Ride services.